At every step in your life you will need to make choices. There are only three choices which you can make i.e. give up, give in or give it all you've got. Honestly, i have had so many moments where i could have made better choices but i chose to either give up or give in. Now, i know that no one can force you to make choices, its entirely your own decision. You gotta think through it and choose something that you will be proud of or something that you won't regret. As a teenager, i made a lot of choices which i am not proud of you. Maybe some of you did too... what may have been a wrong choice for me wasn't a wrong one for you. But somewhere along this road of life most of us have strayed from the right path. What is important is that we should find our way back on to the right path once we realise our mistake. You have made the wrong decision? It's all right... no one is perfect. Learn from your mistakes and don't repeat them again. It took me a while to get over a lot of things in the bargain i did hurt some people too... but they stood by my side cause they believed in me! i was lucky. When we are young we just like to go with the flow, don't want to think about what will happen in the future... well that's not right. 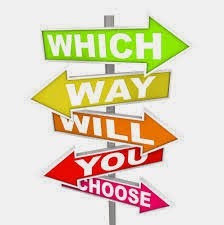 Every individual must think a little bit before making any decision or choice because sometimes these choices shape your life. I know im sounding a little grouchy... im not saying dont enjoy your life... but do think about your future... as the present shapes your future and your past was someday your present! I hope im making sense. I'm no motivational speaker.. but i would feel great if even one person gets inspired by this post and thinks rationally before making choices! Yes! 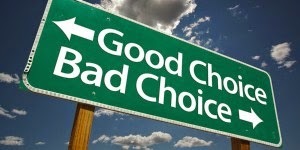 Choice is definitely a vast topic... i was just touching upon an aspect which i have faced myself. But i definitely feel that being happy and content with your decisions at the end of the day is what is important. You fall sometimes... only to rise again... just as the sun sets every evening to rise with all its might the next day!!! I'm glad you agree with my views :) Yes, you shouldn't regret the choices you make. Nice one Karishma.And we learn from them too right so that we can become wiser and selective in future!! Thanks Jhilmil... Glad you liked the post! Learning from one's mistake is the perfect thing to do! !